Disclaimer- I know very little of Warhammer 40k lore beyond what one could gleam from reading a wiki. Any of these may be in official lore codexs or deconfirmed by them. This entire list is based off of my concepts and ideas, which may or may not be compatible with your own. 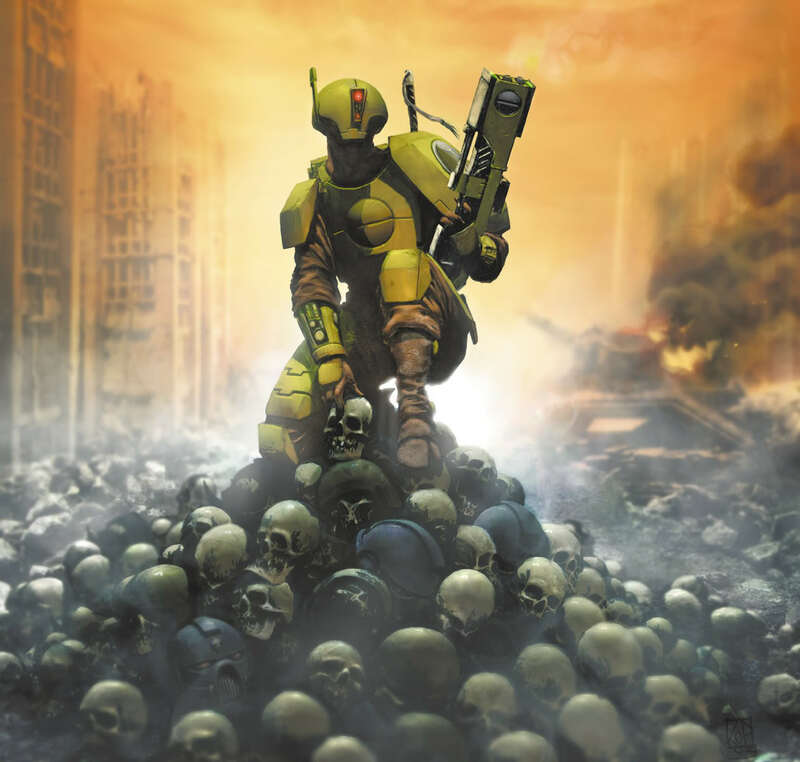 This list is made in response to the complaint of the Tau faction in 40k being too much of the “good guy” faction, and lacking the appropriate “grimdarkness” of the rest of the setting. Newly acquired species have hundreds of thousands of individuals disappearing en masse, taken to laboratories to be experimented on, disassembled for parts for higher priority members, and genetically cataloged. For the Greater Good. Social class and caste position is entirely genetic. There is no chance for advancement in any way- in the same vein, debts or work quotas can be passed from parent to sibling as to the collective your genetic lineage is close enough to be the same citizen. Unlike the Imperium, the Tau can make vast use of AI networks. Each citizen is assigned a personal computer assistant, which also puts them under constant surveillance and learns their emotional state to channel them towards the goals of the state. Tau of the Water caste are required to adopt multiple personalities and personas over the course of their life. If any of their diplomatic endeavors show even the tiniest sign of disrespect, or if a failed communication attempt was because of them, they will be required to uproot their entire life to position in their new persona somewhere else. Many alleged personas don't even exist, and are intentionally staged with all other tau knowing it is fake, specifically to test that Water-Caste Tau's abilities to adopt into a new life. Tau of the Fire caste are prevented from having too many living attachments and positive life experiences. Research shows that suicidal and sociopath soldiers fight with a few percent higher effectiveness rate. Tau dreams are programmed. Approved by a central office, and discretely injected into them along with their normal immunizations. They go on a schedule, allowing periods of dread followed by relaxation, to give the illusion of a personal, inner life without allowing it to interfere with the mission of the greater good. The mechs of the Tau are some of there most fearsome and impressive technologies. Those who pilot them are given special training courses mixed with brainwashing and reassignment; their mechs become objects of physical and mental dependence. They lose the ability to feel attachment to things beyond their vehicle to ensure optimal combat performance. Surgery and eugenics performed on Air-Caste Tau keeps their muscles underdeveloped, their inability to land on planets due to the heavy gravity is intentional, to keep them from seeking opportunities outside of piloting. Many Tau, especially young members of the society as well as young members of other races incorporated into the collective, have brain-scans copied from their bodies and ran through vigorous mental simulations. While not causing any direct harm to the individual, an exact virtual duplicate is put through horrible tragedies and brutal combat simulations to check the war readiness and general fortitude of the Empire's citizens. Once, an entire species was wiped out by the Tau after their homeworld was invaded. This was because their metabolic rate was too high for the food required to feed them, so instead each one was secretly fed fake food that was devoid of nutrition and worked to death. The Tau doctors pretended to not understand what was happening, and the race was lost as an unfortunate accident. In order to ensure a highly functioning work force, information on methods and statistics are often hidden from view. The factory management knows very well how fast the average Earth-Caste Tau can mass produce their allotted parts, but they are still given quotas too high for them to succeed. Videos showing another Earth-Caste working and meeting the quota are sent around to improve performance; even though the video in question is a doctored and highly edited propaganda piece. Sometimes even these methods are not even needed; simply lying to a Tau on their production for the day is enough to create a sense of not working or believing in the Greater Good hard enough. Certain negative habits, such as gambling and minor drug use, are both sustained and covertly added into Tau society by its leadership to further the individuals own doubt in themselves; thus relying on the Greater Good. Using therapists and police officers to enforce ideals into the addicted individual, and making them doubt their self worth. This goes so far as enabling; intentionally manipulating rehousing projects to put addicts near government sponsored dealers. If the operation is about to be busted, artificial confessions are quickly given out and the noncriminals are redeployed to another district.